A traditional local pub in Willenhall serving real ales and showing live sports. 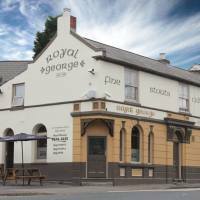 The Royal George is a family run, local and busy pub in the heart of Willenhall. As a well-established pub, The Royal George continues to be a popular attraction amongst the local community, offering a traditional, friendly pub atmosphere and a fine selection of real ales. With a number of events held around the year including popular live sporting events being shown regularly, The Royal George is in a great location for a good pint with a vibrant atmosphere and friendly staff. If you fancy having a great pint in a great atmosphere, come down to The Royal George.